The Run for Tunis, an effort to capture Tunis in late 1942 following Operation Torch, had failed and since the end of the year, a stalemate had settled on the theatre as both sides paused to re-build their strength. The 5th Panzer Army defending Tunis was being strengthened as was the Allied First Army. This battle takes place thirty miles from Tunis in the Medjerda Valley, which has the German held peaks of Djebel Ahmera and Djebel Rhar, later known as Longstop Hill after the position just behind the wicket keeper in a cricket match. On the 22 December the Battle for Longstop Hill commenced with an assault on Djebel Ahmed by the Argylls and two squadrons of the North Irish Horse. By nightfall the Argylls supported by the Surreys had captured the hill but couldn't press the attack to Djebel Rhar the second peak until a small ridge to the north had been cleared of Anti-tank guns and machine gun nest, this ridge was called Sidi Ahmed. The rule system I`m using for this is I Ain`t Been Shot Mum. Off board support of a battery of 105mm leFH18 Field guns, pre-registered fire support. Reinforcements of 2 x Panzer IVs and 4 x Panzer IIIs enter after the Turn Card is pulled out three times. To soften up the defenders the Allies get one pre-game stonk. The German position is set in a small group of buildings with a small compound to the left flank and other small buildings running through the middle of the deployment area. A road runs through and off to the rear of the board where their are two small hills, one covers the right hand flank and the other to the rear of the left hand flank. These two hills have an AT gun dug in on each and the right hand hill has a MG42 dug in. The buildings to the centre has a German Zug entrenched with a Big Man (Level IV). The small compound on the left has the other Zug and the MG42 with firing positions cut in and reinforced walls. The last AT gun and the AT gun team is positioned behind the compound looking down the road. All German units set up on blinds with two dummy Blinds positioned in the centre of the defences. The Allies have to advance across open ground towards the enemy with no cover at all but the dust churned up by the tanks. The tanks advance to the front with the M3 Grants to advance on the hill to the German right flank with the Sherman and Stuarts to attack the centre and compound with a veteran infantry platoon following close behind them. The other two infantry platoons are to attack the compound with a Big Man (Level III) and the mortars giving support. The tanks made good the charge towards the German defences managing to get halfway across the stretch of open ground before two of the AT guns opened up on the Sherman`s,knocking out one and immobilising another. The Grants instantly returned fire with their hull mounted guns forcing the crew of the AT gun on the hill to their front to abandon the gun. The infantry advancing on the compound came under fire forcing them to go to ground and, for the moment, stalling the attack. The M3 Stuarts came out from their Blind to fire HE at the compound catching it on fire. The defenders had no choice but to abandon part of the building. But the AT gun on the hill behind knocked out one of the Stuarts and the AT gun behind the compound knocked out another. With the building on fire and the defenders in disarray coming under ever increasing infantry fire from two infantry platoons which silenced the MG42 position and drove the defenders back into the courtyard on the opposite flank, the M3 Grants charged up the hill and over ran the AT gun and the MG42 position crushing the two guns. It was then that the Allied 3"mortars decimated the AT gun on the hill behind the compound leaving just the one AT gun left intact behind the compound which had new targets in the form of M3 Grants on the hill. The Zug in the middle opened up and fired at the advancing infantry behind the Shermans but with tanks on their flank they were over run in no time. The AT gun behind the compound fired three times at the Grant with no results before one of the allied infantry platoons charged them from the rear and captured the position. With the compound surrounded and on fire the remaining Germans, with the sound of there own tanks just the other side of the ridge, surrendered. With the road captured and the guns knocked out the Panzers were pulled back. With Sidi Ahmed captured the push for Djebel Rhar could now commence. By the 27 April the whole of Longstop Hill and Djebel Rhar had been secured. Longstop was the last great natural barrier barring movement towards Tunis. 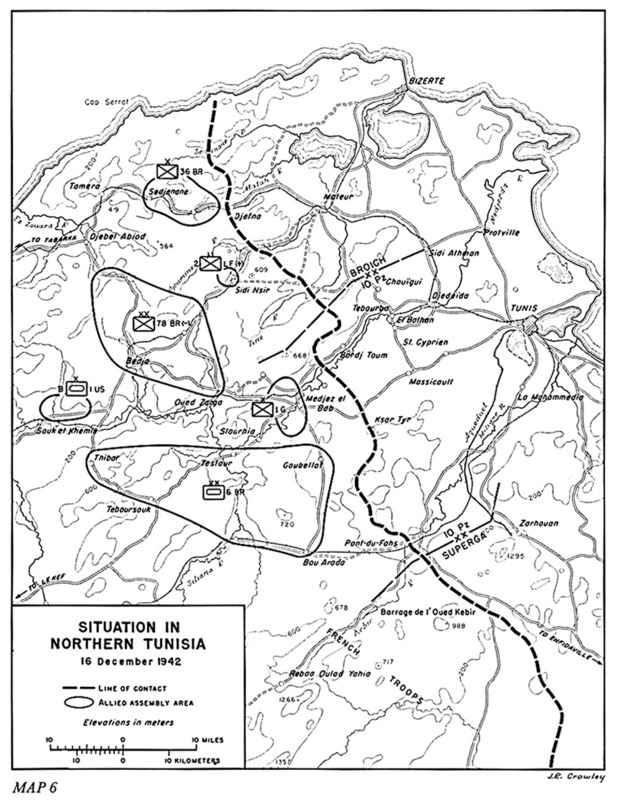 On the 7th May, British armour rolled into Tunis, taking Axis forces buy surprise. By 15th May all Axis forces had been cut off and soon surrendered with more than 250,000 taken prisoner, ending the campaign in North Africa.